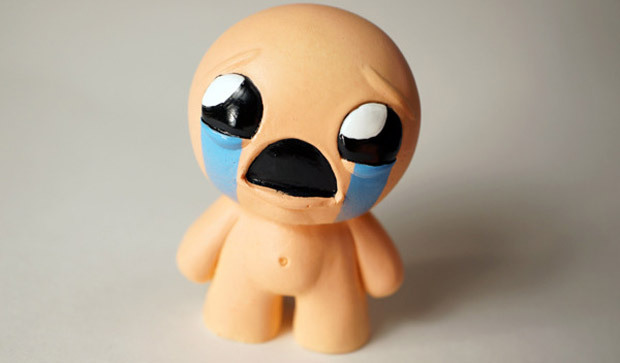 Has it really been a year since The Binding of Isaac released? Time sure does fly when you're playing and replaying such a deceptively large game. To celebrate the one-year anniversary, Edmund McMillen and Florian Himsl are discounting Isaac and its The Wrath of the Lamb expansion by 75% today. McMillen has also stocked his shop with some awfully sad figures of Isaac and co. that I couldn't possibly stand to have watching me all day long from my desk. "If all goes well maybe the adventure will continue next year on console," he writes in an email. That's the only Binding of Isaac news he's giving out this time, though McMillen did mention he's returning to work on Super Meat Boy: The Game for iOS and PC, plus an unannounced title "that should surprise a few people." Whatever the mystery project is, it'll "probably" be announced "in a month or so."